In this season of giving thanks, I would like to jot down my appreciation for the visual spectacles that we enjoy on a daily basis here in the islands: the brilliant flora, majestic sunsets, and that curious aerial phenomenon that we call a rainbow. 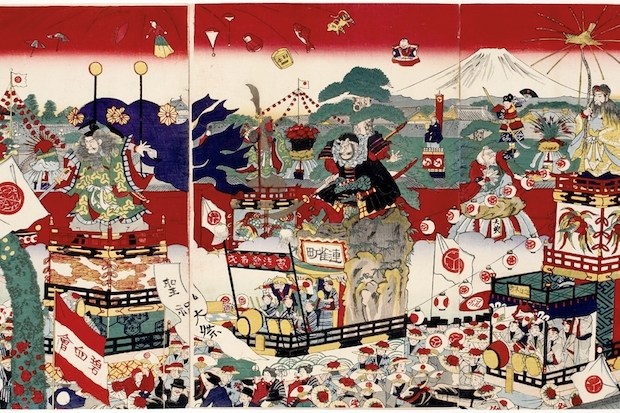 Vibrantly colorful artworks undoubtedly have similarly profound psychological impact, but in Asia for many centuries, such art was not always easy to find. In Japan up until the late 19th century, woodblock prints could only be displayed briefly in order to avoid their colors (derived from such organic dyes as safflower and bellflower) fading from exposure to ultraviolet light. Vibrant textile dyes, furthermore, were revered so deeply that, in order to maintain social order, government officials enacted sumptuary laws that forbade commoners from displaying them in their clothing! Over the past two centuries, we have witnessed a remarkable evolution of color throughout the world. A particularly dramatic chapter in that history occurred 150 years ago, when German chemists discovered that the chemical aniline could be extracted from tar to produce a variety of synthetic dyes. Mauveine (mauve) was created in 1856, followed by a dozen others within the course of a few decades, including rosaniline and pararosaniline (similar shades of magenta), methyl violet, eosine (pink), and xylidine Ponceau (scarlet). From the 1860s through the 1880s, these dyes were introduced to Japan, and the palette of woodblock prints suddenly began to intensify. In 1868, when a constitutional monarchy replaced Japan’s military government, many artists were inspired to use such newly available imported pigments to document their country’s transformation. Some of the first works to use synthetic pigments are currently on view in the Robert F. Lange Gallery for Japanese Prints. The wall text in this print rotation, as implied by its title—Celebrating the 150th Anniversary of the Meiji Restoration and Immigration to Hawaii—deals mainly with historical context. When you enter the gallery for the first time, however, the first thing that you will notice is the vibrancy of these prints. Fans of traditional ukiyo-e might find them a bit startling, but bear in mind that any technological breakthrough (in this case, the discovery of aniline dyes) is followed by a period of erratic experimentation through which artists develop mastery of the materials. Think of these prints as the Japanese equivalent to Fauvism, the avant-garde painting movement that began in 1905 and in which Henri Matisse (1869–1954) rose to fame. Not surprisingly, Matisse and his fellow Fauvists credited Japanese prints as the source of their inspiration. Celebrating the 150th Anniversary of the Meiji Restoration and Immigration to Hawaii will be on view in the Robert F. Lange Gallery until January 13, 2019.